Hardcover, (February 1991) Usually ships within 2-3 weeks. Alessandro Stradella was one of the most important composers of seventeenth-century Italy, contributing significant works to almost every contemporary genre. However, his precise position within the Italian musical baroque has never been properly evaluated, while his biography has long beenenshrouded in myth and legend, following his murder in Genoa in 1682. This book is the definitive life and works study of this crucially important composer. 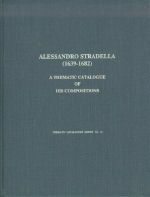 The biographical section is the result of extensive documentary research over many years, and presents a clear account of Stradella's careerand colorful personal life in all the cities where he lived--Rome, Venice, Turin, and Genoa--as well as information on his patrons and the poets whose words he set. The musical discussion offers a clear expositon of Stradella's 308 extant compositions, illustrated with nearly fifty musicexamples.